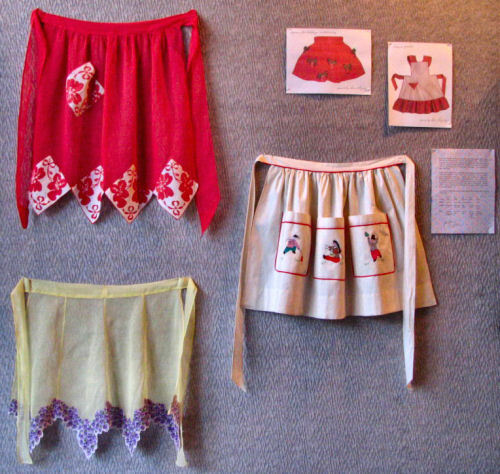 Jean Adler, a musician, mother, and wife in Monticello, Wisconsin shares her apron collection with The Dining Room at 209 Main: My apron collection was inspired by one worn by my grandmother. It was embroidered with the saying, "Never Trust a Skinny Cook." Born in 1903, Grandma Alice was a young mother at the height of the Great Depression. Like all women of meager means she prepared meals with the few items that were in her pantry. It was often said of grandma, "She could make a shoe taste good." I don't recall either of my grandmothers not wearing an apron when they were in the kitchen. It was a habit born of necessity. However, aprons served more than one purpose. Pockets were catchalls for clothes pins, produce gathered in the garden, and sewing supplies. Aprons could also be an "instant" dust cloth. 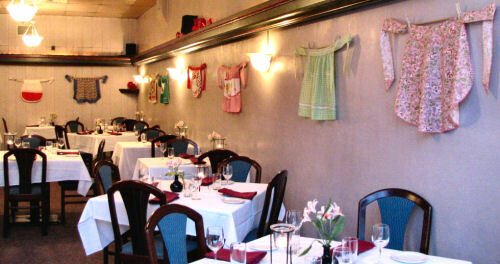 But first and foremost, aprons kept your dress clean. Anyone who bakes and cooks knows that these are messy jobs. In a day when a woman owned but a handful of dresses they needed to stay clean as long as possible. 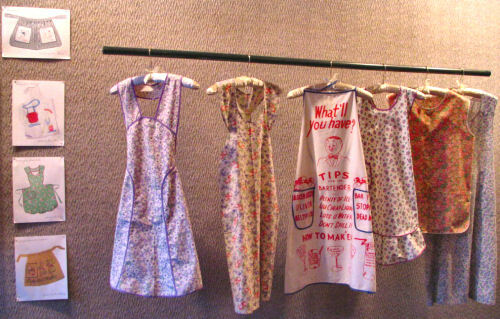 APRON MEMORIES by EllynAnne Geisel, Andrew McMeel Publishing, 2006.